The 3 Toadstools : The fire I needed! WOOO! As you may know I've taken a somewhat sabbatical from playing elf games, and more importantly DMing. Just had a lot of things going on in the last while and I couldn't wrap my brain around doing anything. I decided to take a good step last night and email my old school group for a possible one shot. It's scheduled for the week of my birthday. Normally we go camping that weekend, so we are shooting for the Tuesday! Now of course, my head is running thru far too many ideas! First adventure: I originally thought maybe i'd run Isle of dread because I've honestly been dying to. However this may not end up being a full campaign, possibly just a one session thing. The nice thing about possibly doing isle of dread is that I'd have a lot of prep to do! I've decided instead to run "Palace of the silver princess" because it's also been on my to do list. If they survive and want to keep playing, I think I will do the following. Have the players guard a caravan, and then use the intro for isle of dread from that point. I'm thinking I will have the POTSP happen around the town of Luln in karameikos. Rules: gal darn I've got a LOT of rules kicking around the house. I'm going back and forth between running straight up b/x or whitebox. They both appeal to me. I know the players like having variable weapon damage, but they are not big fans of descending ac. If I run whitebox, I think for ability checks I'm going to do something super simple. Roll 10 or higher. As I've stated before we usually end up having a few drinks while playing, and I feel like whitebox might be the best bet. 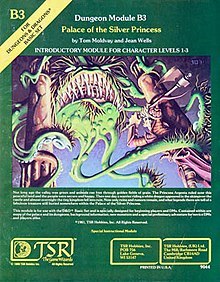 Level: The module is for levels 1 -3, I think what I'll do is have them all create 2nd level characters, along with possible henchmen NPCs. Looks like I'll have at least 3 players, possibly up to 5. In which case I'll increase monsters and the like. Alright, so unless i change my mind, which is bound to happen! I think its going to be the "palace of the silver princess" with whitebox rules. I'm off to go and print some character sheets!